This is a condensed version of the Complete History of SSCA compiled by Ted Anderson, Mahalo in 2004, with editing help from Nancy Zapf of Halekai. Ted's history was complied by an exhaustive review of the 624 Bulletins since the organization’s inception in 1952 and the Bylaws since incorporation in 1975. The full copy of the history that Ted compiled is provided below as a link to a PDF file. 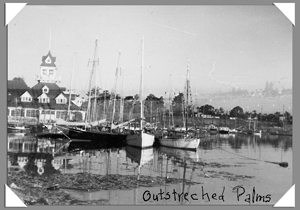 The founders of SSCA were six liveaboard couples whose boats were berthed in Coronado, California: the Carstarphens, Shellback; the Maertins, Evening Star; The Minors, Tropic Bird; the Nissens, Norwind; the Rumseys, Black Dolphin; and the Slasors, Stardust. When Evening Star and Tropic Bird went cruising and sent back reports of their experiences to the remaining four, their letters were copied and sent to an ever-widening circle of liveaboard cruising friends. Thus the concept of the Bulletin was born. The requirements for entry into this loose-knit association were simple: “Ownership and residence aboard a sailing vessel in as much as said vessel is the home of the owner, and full acceptance by the Association.” Upon attaining membership, “all members become Commodores with full privileges of the flag” (a tongue in cheek gesture toward overdone club officialdom which at times so alters yacht clubs that the yacht is no longer important and only the club remains). The original members held very high standards of conduct and were quite fussy about who could join. From the start, the focus of SSCA was for members to share cruising information by sending letters about their experiences to the Bulletin, to recommend others of high character for membership, and to “leave a clean wake” so that others who follow will be warmly welcomed. Thus the Clean Wake Policy has been an integral part of SSCA from the beginning. As the San Diego “liver-aboarders” sailed away, the workload became too much for those left behind, and the Association found willing folk near Los Angeles (Jun 56). The new home of SSCA, known as Upstretched Oilwells, continued for another three and a half years until Dec 1959. During this time the membership grew only slightly to 72 Commodores, 33 of whom were out cruising. As more and more members sailed away, this operation suffered the same fate, and SSCA moved back to San Diego where it remained for a bit over four years, until Apr 64. 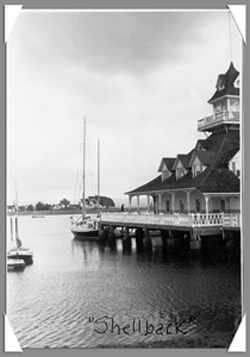 Then it was back to Los Angeles for almost three years until Dec 1966, returning to the Silver Gate Yacht Club on Shelter Island, San Diego for seven years until Nov 1973, then to Los Angeles (Venice) for one and a half years. From 1967 to 1973, Commodores Babe and Larry Baldwin, FAITH, led the effort to print the Bulletin each month. Commodores John and Mary Lavery, SITISI, paid for a professional typist and printer. In 1974, when the Baldwins wanted to pass the Bulletin job on to someone new, Dave and Betty Wittwer volunteered to take Home Base to Marina del Rey. Membership requirements were modified in the early years in an attempt to handle new situations. Ownership and residence aboard one’s own vessel, plus acceptance by the members, was deemed no longer sufficient. An early provision was added that the prospective member had to have the intention of cruising (Mar 53). Then we find the need for the membership to be terminated upon moving ashore (Feb 54); an introductory letter was needed from a sponsoring Commodore (Jun 54); sponsor must know the persons well (Nov 55); sponsor must have been a member for a year (Nov 55); the applicant’s names must be published in the Bulletin for three months (Nov 55); a desire to limit the membership to 100* (Aug 54, Jan 57); a liveaboard requirement of six months (Sep 57); a letter of introduction from the applicant, an increase in the liveaboard requirement from six months to a year, and the sponsor requirement raised from one to two sponsors (Feb 71). 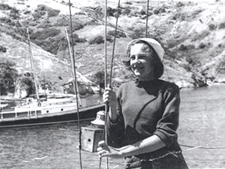 These changes were made to maintain the traditions and standards of the founders and early members, namely that SSCA was a “disorganization” of dedicated liveaboard sailors. Limiting the size of the membership was deemed necessary so that volunteers would be able to handle the work of managing the Association and publishing the Bulletin. *A membership includes all the recipients of a single issue of the Bulletin. During these early years several complaints were made repeatedly in the Bulletins. These included a shortage of letters; the expense of returned Bulletins due to the failure to provide address changes; late membership payments; a shortage of typists; a heavy workload for the editors; members moving ashore and not notifying the editors; problems coordinating the sponsor letters with applicant letters; marina restrictions for the editors; no space for chart storage; and tight finances. Many of these problems were overcome by moving the operation from time to time and by tightening the requirements for membership (see above), by discontinuing the chart exchange (Jul 60), and allowing Ex-Commodores to continue to receive the Bulletin (Apr 64). Compared to their financial difficulties, however, these were minor irritants inherent in a growing volunteer organization. Regarding finances, the philosophy was to do everything possible to minimize the cost of membership by relying on volunteers as much as possible. But from time to time there were volunteer shortages. Whenever there was a shortage of funds, a hat was passed to keep things going. There are many references to member donations in the Bulletins. For many years this worked well and the main cost was postage. Eventually the reproduction equipment wore out, however, and, faced with a major expense, they resorted to commercial printing (Jan 67). This cut down on their storage needs and lessened dependence on volunteers, but added a significant fixed expense largely beyond their control. Despite these problems, members were extremely proud of their “disorganization,” and took steps to maintain it as such. For example, the artwork in the Bulletins through 1967 often displayed DISORGANIZATION as the name on the stern of a boat. They knew that “it will always be imminently in peril of breaking up and coming apart at the seams until the day that it is organized. But then it will no longer be the original SSCA” (Sep 54). The new financial situation caused by the decision to print the Bulletin commercially was resolved by “extending the privilege of subscribing to the Bulletin to anyone interested in our activities” (Jan 67). The response to this initiative was so great that joy prevailed at Home Base. Subscribers who volunteered as helpers to the Editors were a welcome bonus of this change (Dec 67). However, considering the strong feelings about an organization open only to “liver-aboarders dedicated to cruising,” this was a major change for SSCA. Several times SSCA almost folded, but volunteers were always found and the Association continued to thrive. Extending the Bulletin to subscribers greatly eased the tight finances. Commercial printing led to a much more readable Bulletin. Complaints were generally few, SSCA had a positive worldwide reputation, and everyone seemed content with the operation. For nearly 23 years, SSCA had been a major influence in the cruising community. In 1975, a plea went out in the Bulletin looking for a new organizer. Ginny Osterholt, a member of SSCA since 1955 who had since moved to Florida, answered the call. In May 1975 the Wittwers flew to Florida to interview her. It was then decided to hire her and move Home Base to North Palm Beach, Florida. The Commodores gave Ginny $300 for start-up expenses, but for several years she used her own money for the office, phone, postage and gas costs to run SSCA and organize Gams. She began producing the Bulletin on her typewriter with the July 1975 issue and typed every issue until 1984, when SSCA purchased its first computer. In Dec 1975, Ginny drove to California to bring back SSCA gear in her van and while there, she helped organize a SSCA Christmas Party at the American Legion Hall in Playa Del Ray. It was a reunion of old friends as well as the farewell party of SSCA in California. With the advent of commercial printing and the resulting decision to include subscribers to increase income, limiting membership to 100 was no longer necessary nor desirable. Membership rose as high as 155 in Aug 1970, but dropped to 111 by Sep 1975. 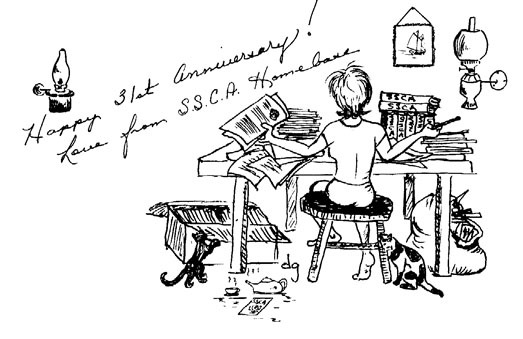 Although the concept of “disorganization” was taken to heart as an important feature of SSCA, the Association nevertheless had to become more organized in order to survive and grow. Thus on December 18, 1975, SSCA was incorporated as a Florida Not for Profit Corporation. The Association was initially organized with a five-person Board of Directors, one of whom was the Editor, and a set of Bylaws. A provision was included that any actions taken by the Board and/or the Editor during the year had to be ratified by those Commodores who attended an Annual General Meeting (AGM) to be held each December. 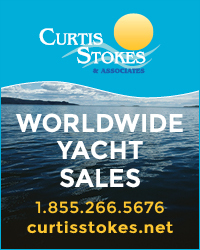 Only Commodores, namely those who maintained their lifestyle exclusively aboard their boats, were allowed to vote. Subscribers henceforth were called Associates. Two years following incorporation, the Board was increased to seven directors (Dec 77). It was not until May 1989 that the provision that Board actions required ratification by the Commodores attending the AGM was dropped, and a process of mailing important issues to all Commodores for their vote was adopted. In Jan 1978, in the first departure from a purely volunteer-run organization, the Association voted to pay Ginny Osterholt a salary of $300 month. Ginny was the Editor, Office Manager, Treasurer, and Secretary. After many address changes as Ginny moved around with her husband, Bill, Home Base was moved into a rented facility for the first time in Nov 1987. Thus the operational costs for SSCA gradually increased during these years. The phenomenal growth in membership following incorporation was encouraged by design and was clearly motivated by finances. The big push to bring in Associates was highly successful. At incorporation there were 111 Commodores and an unknown number of Ex-Commodores and subscribers. During the next two decades, the membership rate of growth was pretty steady and averaged an increase of 300 per year, reaching 1,950 in 1983--10.7% of whom were Commodores. Ten years later a peak of 5,700 was reached in 1993, 10.3% of whom were Commodores and Rear Commodores. Contrary to expectations, growth did not result in financial stability. There were several instances in which the Association was in minor financial trouble during this period. As fixed expenses increased, periodic membership drives helped to overcome the shortfalls. For example, in 1979 President Herb Mordecai appealed for “all to sign up new Associates to offset the projected losses in 1979 and 1980” (Feb 79). With financial losses of $2,000 in 1979, $5,000 in 1980, and $26,716 in 1991, it is clear that financial stability was an ongoing challenge. There may have been other difficult financial years during this period, but the records are long gone. While SSCA was going through its great expansion in the years following incorporation, the operation appears to have been managed relatively smoothly. Ginny was very popular with the membership, the financial situation was reasonably stable, the Bulletins were published regularly, and the one-person office managed without serious conflict. Due to the trials and tribulations inherent in managing a 6000-member distributed volunteer organization, SSCA has struggled organizationally. Much of this tumult occurred during the early 1990s and recently in 2003. The staff turnover was pretty much continuous throughout the 1990s, but has been stable for the most recent four or five years. During this period, the Boards had many heated debates about complaints by Commodores and Associates concerning the requirements for Commodore and the strongly held perception of elitism. Some Directors resigned as a consequence of these debates. During the past decade or so, the membership numbers have seen ups and downs that reflected random membership campaigns. Memberships, however, never exceeded the peak of 5,700 in 1993, and there was a 14% loss in membership during 2001-03. Reasons for the decline have been attributed to several causes, such as elimination of the insurance discount program; the general decline of travel since 9/11; the economy; and the increasing reliance on electronic communication instead of mail forwarding, leading some members to drop their memberships when cruising. Want to know more? Download the Complete History of SSCA. In 2008, Judi Mkam was hired as Association Director, and Barbara Theisen was hired as Editor, when things stabilized organizationally. Judi was very effective at controlling costs while maintaining and increasing services for the SSCA Members. With the advent of the internet, and with the Gam and Annual Meeting being moved to Melbourne, FL, the Home Base office space was downsized. SSCA survived the economic downturn from 2007-2012 with little negative impact and was in reasonable financial condition in 2013. Over the next few years, SSCA continued to find ways to maximize service to the membership for minimum cost while maintaining volunteerism as a key SSCA tradition. In 2017, the board decided to make a management shift and hired KFR Services, Inc. to manage and operate the Association.